Student leaders have achieved an incredible feat in the last year. In four districts across the state, students have fought for, and won the creation of student led budget decision-making bodies within their districts. In some regions, students are breaking ground in the state, piloting projects California schools have never tried. In Long Beach, Oakland, and Fresno, the fight for Student Advisory Committees to be a part of their district budget process has been hard, making the victory so much more meaningful. A student advisory committee is a proven best practice for engaging youth in school budget decision-making. The committee is made up of students representing schools in their districts who are engaged in understanding their district’s budget and budgeting process and weighing in on where funds should be allocated to best serve students. Students on these committees play a crucial role in engaging the broader population of students in their schools. Shydae Garcia, a Junior at Edison High School in Fresno is particularly proud of her work on getting a commitment from Superintendent Michael Hanson to work on the implementation of a Student Advisory Committee in her district. 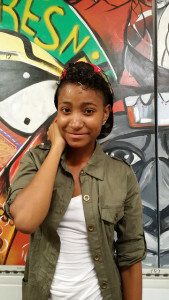 Shydae has worked with her peers to educate other students on the need for a Student Advisory Committee, and to meet with district officials to advocate for the need for the committee to create better policies that would truly serve student’s needs. For Shydae, the most exciting moment of the campaign so far has been meeting with Superintendent Hanson. For students, meetings with school or district officials, even legislators can be really tough. Adults are sometimes dismissive of youth needs, or agree to meetings to make students feel good rather than to really engage on important topics. Because of the hard work they did leading up to this meeting, student’s met with a superintendent who was excited to hear from youth about how to move forward on the committee, contributed ideas of his own, and even held off another meeting to prioritize continuing the important conversation he was having with students. Winning the student advisory committees in Fresno, Oakland, and Long Beach means that students aren’t just passively waiting for their schools to change. They have the space to step up and improve their schools themselves. Shydae is particularly concerned about the need for more tutors and graduation support for students in her school. She hopes that representation through the committee will help allocate funding toward the areas where student’s feel their schools need the most support. Above all, she hopes that the Student Advisory Committees being implemented across the state change the culture in schools to one where students really feel valued and feel they can make a difference, and that this leads to more of her peers staying in school and graduating.